Gambian security forces have beaten and rounded up dozens of political activists calling for the resignation of strongman President Yahya Jammeh ahead of his re-election attempt scheduled for December, witnesses said Friday. Demonstrators led by the leader of the youth wing of the opposition United Democratic Party, Solo Sandeng, held a rare protest just outside the Gambian capital on Thursday before being beaten and held incommunicado. Eyewitness Omar Nyang described riot police, troops and members of the country’s notorious intelligence services confronting dozens of peaceful protesters in the streets. 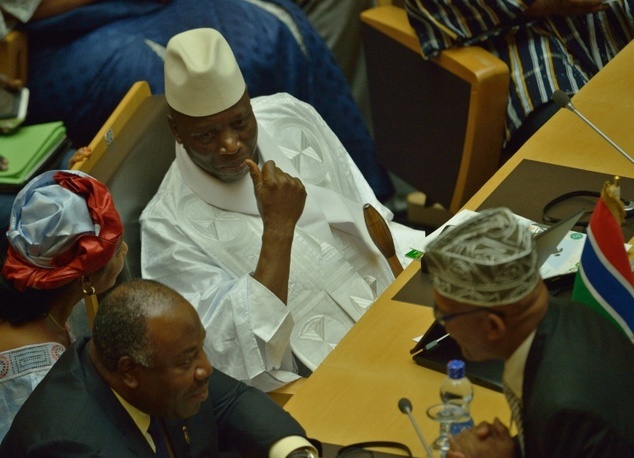 “The protesters carried a banner with the inscription, ‘we need political reforms’, and some of these activists were suggesting that President Jammeh should step down since he is responsible for the economic hardship in the country,” Nyang told AFP. According to Nyang, the protesters were initially confronted only by regular police, but after demonstrators refused to allow the arrest of Sandeng, heavy-duty reinforcements were called. “A truck filled with personnel of the Police Intervention Unit (riot police) arrived at the scene. The Police Intervention Unit personnel started beating the protesters and pursued those that wanted to escape,” he said. The protesters were loaded onto a truck and the leader of the group was taken away in a separate vehicle to an unknown destination. The president was out of the country when the protest happened, attending a summit of leaders from the world’s Muslim countries in Istanbul. Jammeh, a military officer and former wrestler, has ruled the tiny west African country with an iron fist since he seized power in a coup in 1994, and is regularly accused of a catalogue of human rights abuses. The protest comes eight months ahead of a presidential vote widely expected to hand Jammeh a fifth term in power. The timing also coincides with the recent opposition party announcement of a lawsuit against the state for keeping an alleged presidential supporter as chairman of the electoral commission in power long after his mandate expired. A US State department report released this week accused the Gambia of torture, arbitrary arrest, incommunicado detention and enforced disappearance of citizens, as well as routine harassment of critics. Previous articleGambia: NIA Rounded UDP Executive Members; Detainees Tortured Overnight! Next articleGambia: Breaking News: Popular Revolution Hits Gambia; As Opposition Leader Leads A Nationwide Demonstration!